We work exclusively with development and production of medical devices. 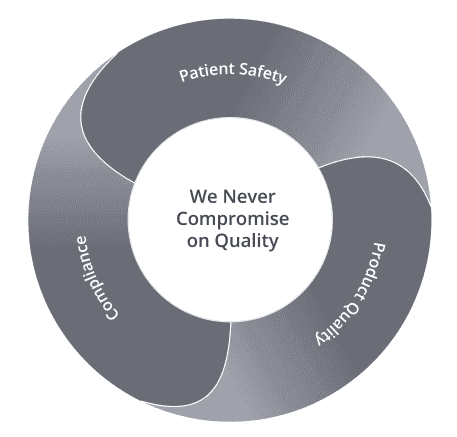 As these products and components have a significant impact on human lives, patient safety is our top priority. Everything we do is built on a foundation of quality. Our systems are mature, and we make the up-front investments in quality assurance and validation to ensure that each product we manufacture meets the same high standards. Our reputation for quality is the result of an approach that builds it into every step of the process. All our activities have one common goal, to avoid any defects and variations, and to ensure a documented traceability, this is what we call Quality Excellence. Our strength lies within our extensive knowledge of the entire requirement set. We understand the market, the products, the medical device laws and regulations and the customer requirements as well as the requirements of the products. Our operators are well trained and accustomed to work with high quality standards. There are constantly ongoing dialogues about how we can optimize our way of working, we emphasize employee involvement and teamwork in measuring and systematizing processes with the purpose to reduce variations, defects and cycle times. Elos Medtech Complete Performance™ offering entails an unbroken chain from design to manufacturing, packaging, distribution and logistics. All development and production complies with regulatory requirements and rules throughout the entire chain. Our quality and environmental management system is well documented and we are certified against the standards required in the area.